Malaysia-based Keow Wee Loong is a photographer and when he married Marta Sibielak, he knew he had to do something truly special to make their wedding photos memorable. So, the newlyweds spent three months travelling and taking pictures in some of the world's most recognisable locations and the results are stunning. The couple travelled to London, Venice, and Copenhagen, as well as more rural locations such as Norway's Trolltunga and Mount Fuji. Mr Loong says the idea for the unique multi-city photo-shoot came to him while he was shooting another couple's wedding earlier this year. "As a photographer I always wanted to shoot my own wedding photos," he tells the Daily Mail. "The most important part for me, other than documenting our wedding, was to show the journey with your loved one is more important." "Our families thought it was a crazy idea, but worth it," he adds. To save money, he decided to shoot the pictures himself using a remote control connected to his camera. Of course it wasn't easy lugging around equipment but they managed to do the entire photo-shoot in under 1,000 euros or approximately 72,000 rupees. 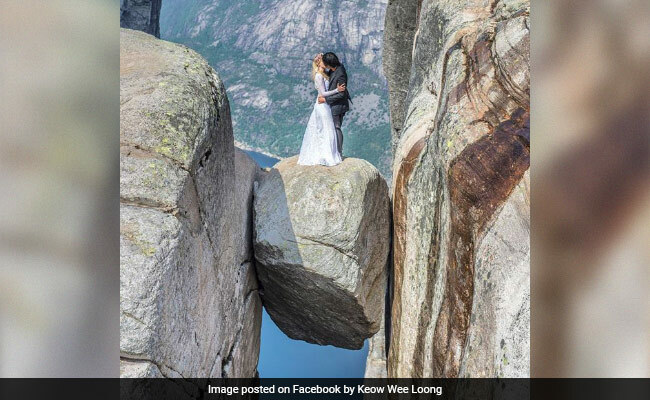 "The tricky part is carrying all the heavy gear, wedding dress and doing your own make up to the top of the mountain in freezing temperature," Mr Loong writes on Facebook.